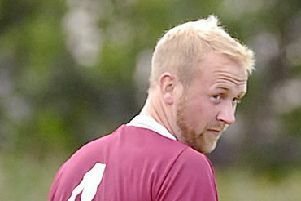 Bonnyrigg Rose captain Johnny Stewart expects a tougher test from Tynecastle this weekend compared to their last outing against each other when the Lowland League-hopefuls netted 13 goals. Midfielder Stewart was caretaker manager back in October when he masterminded the 13-1 victory, but a lot has changed since then, with Tynecastle given a new lease of life under manager Calum Elliot. Bonnyrigg, unbeaten since September, are eager to wrap up the East of Scotland Conference B title as soon as possible as they target promotion to the Lowland League at the first time of asking. So they won’t be in the mood to take it easy against the Meggetland club. “It was one of the games when I was caretaker manager so it was a great result personally and for the team as well. We were quite ruthless that day – we got our chances and we took them,” said 28-year-old Stewart. “Tynecastle maybe let their heads go down quite easily and kind of chucked it a little bit. I’m sure I took myself off at half-time and that might have made bit of a difference in the second half as we scored more goals when I went off. You would imagine Bonnyrigg have got bored of winning already given how easy some of their matches have been so far this season, but not so says Stewart, with himself and his team-mates hungry for silverware. “You never get bored of winning but some of the games have been quite challenging in the sense of getting yourself motivated and getting up for it. It’s a step the club had to take to go the path they want to go and we did know that we would find some of the games quite easy. Top goalscorer Kyle Wilson won’t be in the Rose squad tomorrow after the Fife-based player secured a move to Lowland club Kelty Hearts, who were keen to sign him on a pre-contract in the summer but made a move last week with Bonnyrigg opting to cash in rather than lose him for free. It is a match, despite being massive underdogs, that Tynie boss Elliot says his players will approach with confidence after going unbeaten in their past three since losing to Lothian Thistle Hutchison Vale in early January, with back-to-back victories over Dalkeith Thistle and Burntisland Shipyard. “It will definitely be the toughest match we will have faced since I have been in charge,” said Elliot who took over in November. “I would imagine it will be one the boys will be looking forward to after the last scoreline. A few of them will have a point to prove and be determined to show they are better players than what they showed that day. “We’ve had three good results since the Lothian game. After that we had a discussion and the boys were told how they had to improve, and since then the response from them has been first class so I can’t complain. Possibly for a year they’ve been used to losing games.